Five months into 2017 nine venture-backed technology companies have gone public compared to 14 in 2016. 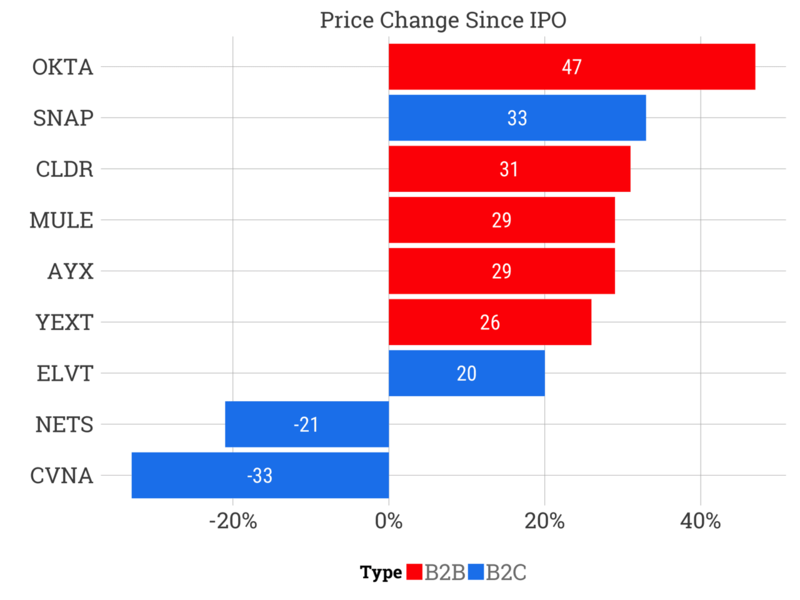 Four consumer companies and five enterprise companies have popped on average 29% since their IPO pricing. Only two, Carvana, an online used car dealer, and Netshoes, a Brazilian ecommerce company have traded down from their IPO pricing. The other seven have demonstrated the broad public investor demand for new offerings. 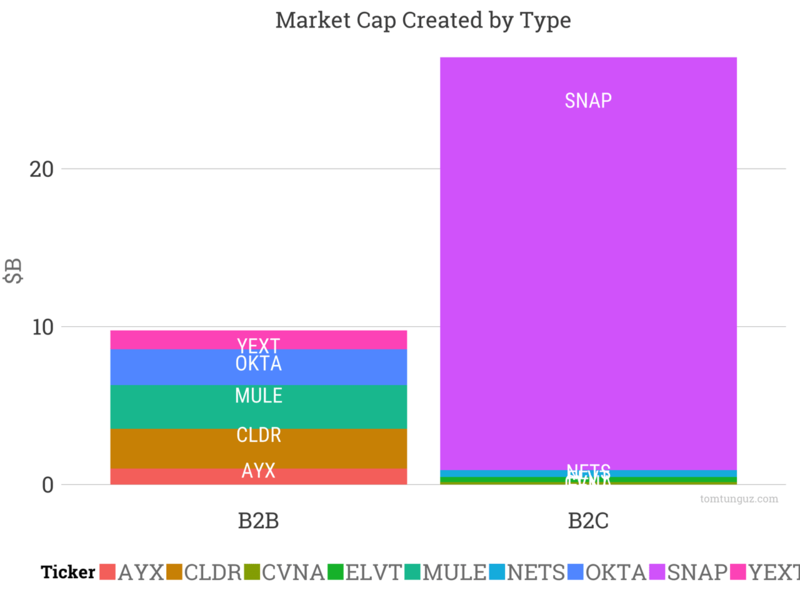 B2B companies’ market cap totals $9.8B which is a third of B2C at $27B. Of course, Snap accounts for $26B of the $27B, or 96% of the consumer market cap. This bar chart characterizes a truism that differentiates consumer companies. There are fewer consumer companies of scale, but when they succeed, they can be monstruously large, and grow much faster than B2B companies. Snap is the youngest company of the cohort, founded in 2011. Most of these businesses are growing very quickly. Snap grew revenues by nearly 6x annually. The core B2B companies spanned 38%-87% annual growth. None of these businesses are profitable. The median company generated -28% net income margin, though NetShoes and Elevate Credit are both within sight of profitability at -4% and -9% net income margin. But if the trading patterns relative to IPO price are any guide, the market prefers growth to profits. Appian is likely the next venture backed technology IPO, coincidentally, my first employer after graduate school. Best wishes to the team there. 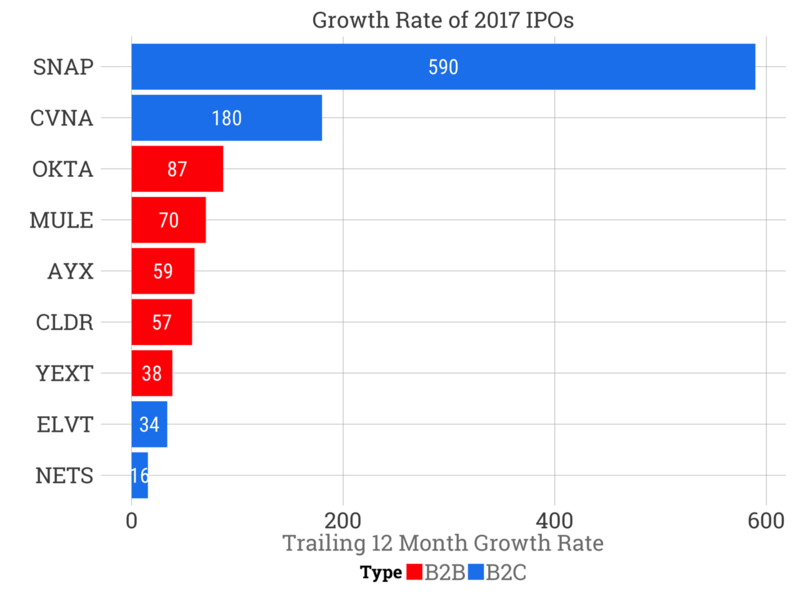 The IPO market in 2017 seems to be very healthy and is on pace to be twice as active as last year.